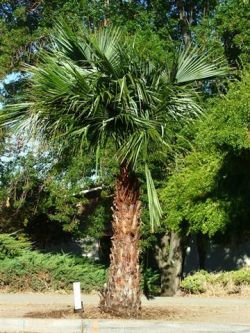 Comments: Fan palm native to Baja California and Sonora, Mexico. Pale green slightly glaucos armored fronds on slender trunk. This palm is self pruning and doesn't develop a "grass skirt" like the Mexican Fan palm. Good drought and cold tolerance. These trees were placed on Palm Ave. October, 2003.